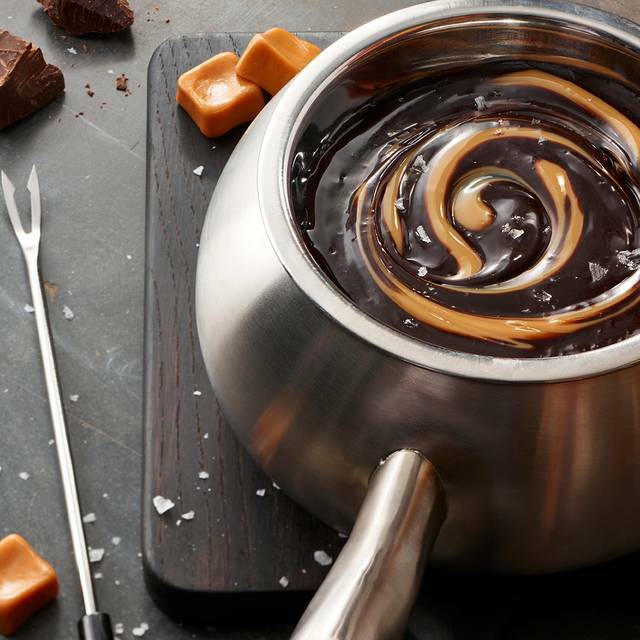 You must make reservations at least 5 minutes in advance of the time at The Melting Pot - Destin. Between Forest Shores Dr. and Geronimo St. Happy Hour Every Day from 4-7 pm in our bar and lunge area! We are happy to cater our chocolate fondue. 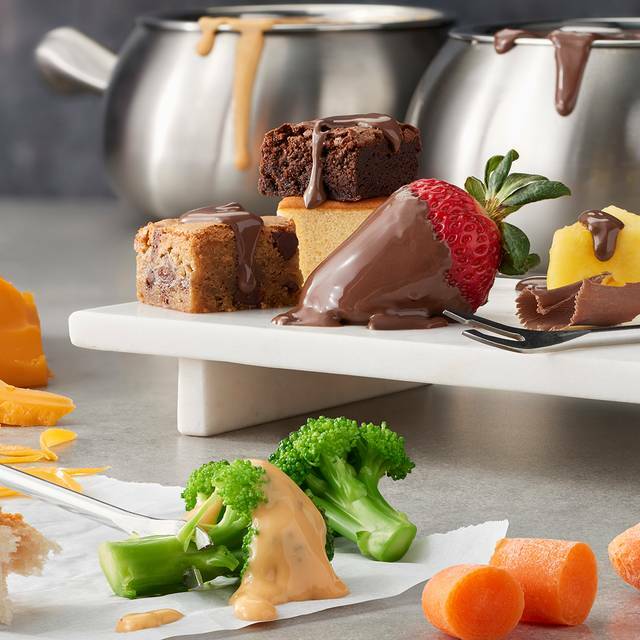 Enjoy a sampling of our most popular dipping items along with our decadent chocolate fondue. Please email lucinda.hollis@meltingpotfranchise.com for more information. Turn up the heat during your next evening out. 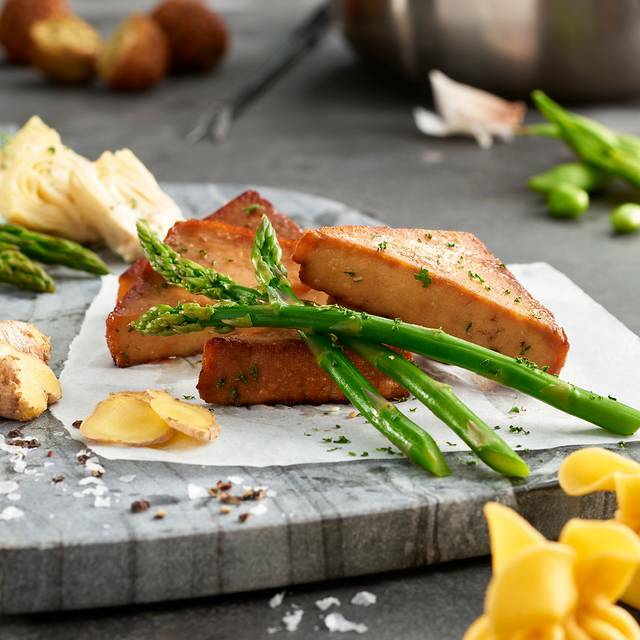 The Melting Pot brings all of Florida’s finest qualities to the table, from personable southern service to savory entrees. 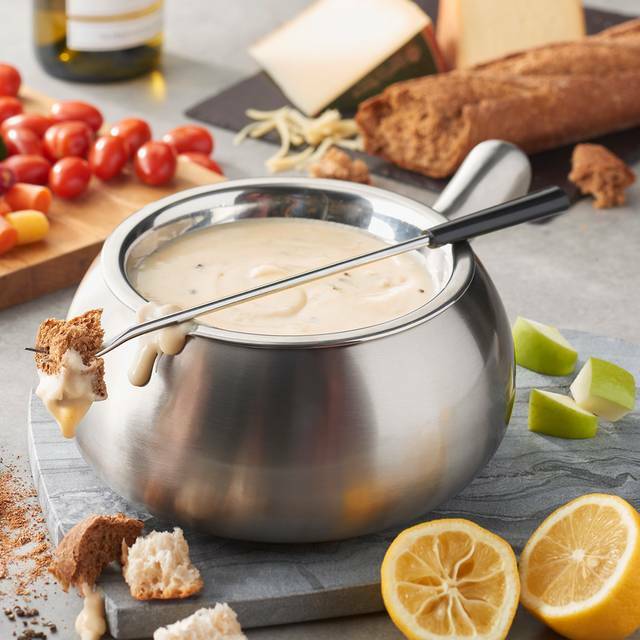 Dip your appetizers into flavorful blends, or dive into one of our famous cheese fondues. 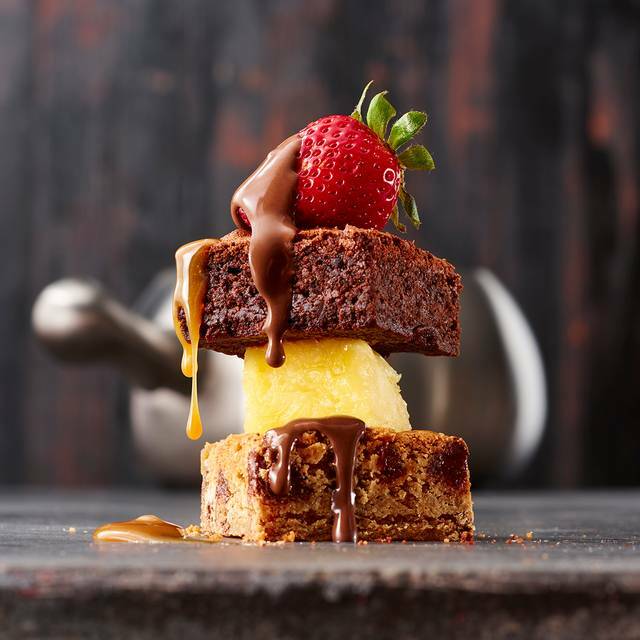 We may be known for our desserts, but interactive displays and delectable sweets aren’t all we have up our sleeve. Every entrée is carefully crafted with local flavors. Appetizers start with artisan cheeses and signature salads add just the right touch. Craft unique, customizable flavors that complement your particular tastes. From our table to yours, allow us to welcome you to an inviting, friendly restaurant just as welcoming as home. Gruyère | Raclette | Fontina | Beef Broth | Red Wine-Infused Caramelized Onions. Served with: complimentary charcuterie board. Celebrate Cinco de Mayo with $5 Margaritas, $5 Fiesta cheese fondue, and $5 Flaming Mexican Chocolate fondues! Join us for Easter Brunch! 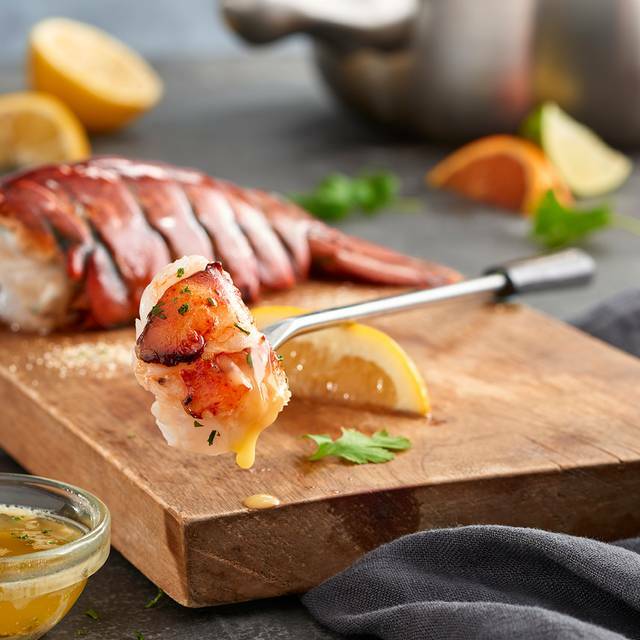 from 11 am- 7:30 pm enjoy any cheese fondue, any salad, and an entree of steak, herb chicken breast, and shrimp for $24 per person. 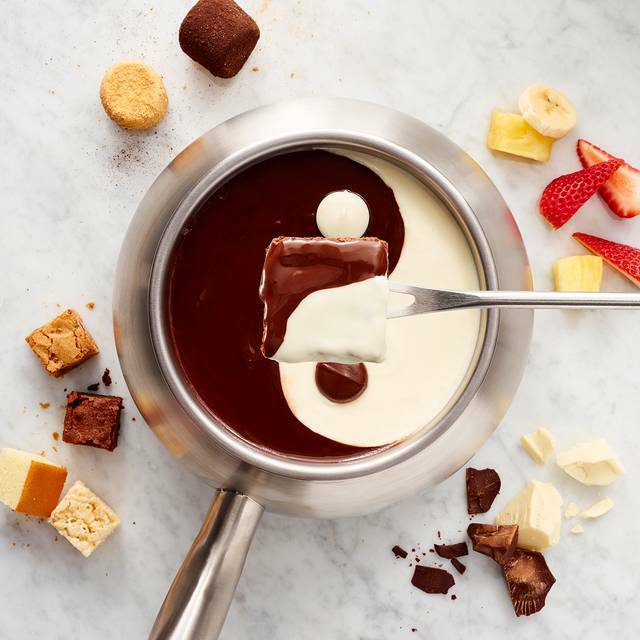 We always love an evening at The Melting Pot. It's so nice to do something different. The cheese and chocolate are so delicious and never disappoint. This is a fun experience. We did not have a good waitress. She talked really fast and rushed our service. It is a four course experience, but it felt more like a three course experience. The cheese fondue and salads came at the same time.... we were not even finished and the next course was arriving... it was a Birthday dinner and we had lots of time. The restaurant was empty so no one was waiting in line to get in. The fast pace ruined the experience. The food was excellent but having a good server is key to the overall experience. My daughter was visiting from CA and this is her favorite place to eat! We celebrated both our birthdays and not only had a great time, we created lifelong memories. Thank you Jake for taking such awesome care of us! Service was great. Food was good but overpriced in my opinion. My chicken was a rubbery texture. Steak was very good. Cheese fondue delicious and chocolate fondue wonderful. I just think the price is outrageous. You pay more for the experience than the actual amount of food and/or quality. Brought my family here, we will remember it forever, but not for the reasons you'd think, for the outrageous price! 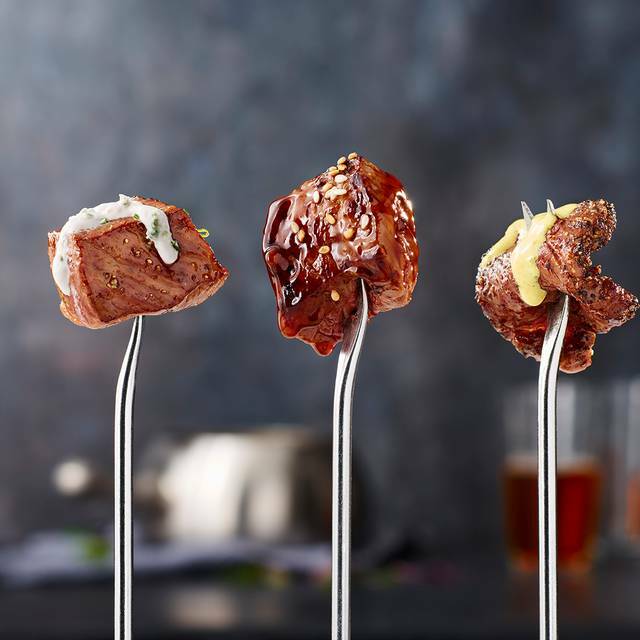 The concept is fun, though the menu is hard to follow and there are times when everyone has to agree on one thing, such as the dipping sauces and cooking method. That's another thing, for $220 for 4 people I didn't feel that we should've had to cook our own food. I thought everything would come out cooked and we would simply dip. (Not the case with the entree). Portions are small for the price. Between the 4 of us we had 12 shrimp, and probably less than a 6 oz steak. Granted there was also chicken, but that's cheap. The deserts were the same way, there's a lot of pretzels yet only 1 Oreo crusted marshmallow per person. I would go for just desert on a special occasion. But I won't likely go back. We had a great experience and our server was very helpful. It was not something you would do often, but the 4 course meal is something we would recommend for first timers. Absolutely loved it! Have lived in the area for almost 15 years and have always wanted to go but never had the chance. Finally did, and will definitely be back and soon. Went with my mother for a celebration dinner and we both were amazed at what a good time we had and how much we enjoyed it. Can’t wait till next time. Glad you enjoyed everything! Will will acknowledge Paxton for her excellent service! A bit pricey but an all around lovely place and experience if you're willing to spend. Awesome experience as always. We go to same Melting Pot 4-5 times a Year! Thank you for your review we look forward to serving you again! Our waitress, Paxton, was amazing in her service. She provided good advice on the choice of food to eat and kept a pleasant and cheerful atmosphere for me and my friends. It seems like the Melting Pot has taken a step down. Menus used to be colorful (book style) with pictures and now just printed on one thin page, front and back in black and white. Menu looked like it was printed on a home printer. We had a party of 4 people which used to consist of 2 cook tops, this time we only allowed one cook top and when we asked if we could have a table with 2 cook tops, we were told no. During dessert, strawberries were cut up, used to be served whole. Cheesecake is no longer included. On another note, waitress was very professional and courteous. We had a wonderful time! The food was excellent and the experience was amazing. Our waitress was great until our main courses came. Once she brought our main courses she disappeared for over 20 minutes. We eventually flagged down another waiter who sent over the hostess. She didn’t apologize for the tardiness of our waitress, she only took away our dirty dishes. We had to ask her for more water as our water cups had been empty for nearly 15 minutes. Another waitress came to the table and refilled our waters. I asked if our waitress was okay and mentioned that we hadn’t seen her in over 20 minutes. She blew it off by saying that they do teamwork and they help each other out. My husband and I have a great sense of humor so the whole ordeal was humorous to us but other guests may not be so forgiving. When our waitress finally came back to the table there was no apology, she acted as if nothing had happened. We will definitely come back but we’ll hope for better service next time! We’ve been here a couple times for Anniversaries and birthdays. We always do the 4 courses but even a happy hour with just cheese or just dessert would be fun. Our server, Jessica, was prompt, attentive, and friendly. We usually sit at lovers lane which is the best for a date. The only thing we noticed this time around was the very odd picture of laughing dogs in our romantic booth lol. Amazing experience and a cute complimentary birthday dessert. My Waitress Jessica was very prompt, polite, and helpful in every way! She gave me an my wife an extremely informative tutorial on how to fondue cook our meals and desserts. We are definitely planning to go back again!! Valentines date. Best isolated table spot,picture of some dogs and we’re animal lovers so that was a plus,great slow jams until this drake song came on cause that’s not anywhere near classic r&b which was the feeling I was getting initially. Waitress was very friendly and knowledgeable. Patient with us while we figured it out,but at the same time if she wasn’t around as much it would of had more of a 1 on 1 feel,which is the reason I love the melting pot. Overall outstanding. I think our waitresses name was Jess. Jake our server was amazing, just the right amount of service without over-servicing us on our date night. Food was probably the best we have ever had and we have been to MP dozens of times. The service was much less desirable vice our last visit. I think she was new. Our drinks were incredibly slow / forgotten. The wrong cooking style was brought to us. The choices can be a little confusing if you don't go very often. Last time the waiter explained it to us very well but this time the service was not as good. I still recommend The Melting Pot. I hope they bring new employees up to speed soon. My husband and I made an online reservation. We were very surprised to be seated in a quiet romantic room. The food was absolutely fantastic and so were the drinks. The only downfall was the waitress. She was nice, but talked through everything way too fast and was even yawning during explanation of the menu. Overaltwe had a really good time. Server was excellent. We decided to try the grilling option but wouldn’t do it again. Our favourite is still the canola oil. The interior seems a bit tired but it was our server, Sean, that did an outstanding job and created our rating of “Outstanding”! We had a really great night celebrating a birthday. I made a reservation online and we were seated in a little private booth. The service and food was fantastic. Little kids whining and terrible waiter. Wow, it’s easy to ruin a special evening. Might as well just go to Outback where you expect noisy atmosphere and average food/service. Loved our dinner! Great food and staff! Thank you for a nice evening! Outstanding. I was so pleased and happy we went. Fabulous and will go again and again! A great experience, service was amazing, atmosphere was perfect to celebrate our 10 year wedding anniversary. Portions have decreased slightly. You pay for the experience/service. Jessica was a great server and very helpful!!!!!!! Skyler was an outstanding server and ensured our visit was the absolute best time possible. Whatever you are paying him it's not enough. Nice job Skyler! This is a unique fondue type experience that is not available everywhere. We enjoy it but some of our friends don't like to have to cook their own food. It's eclectic and fun for us. The food is typically quality although you may have a hit & miss on a few items. 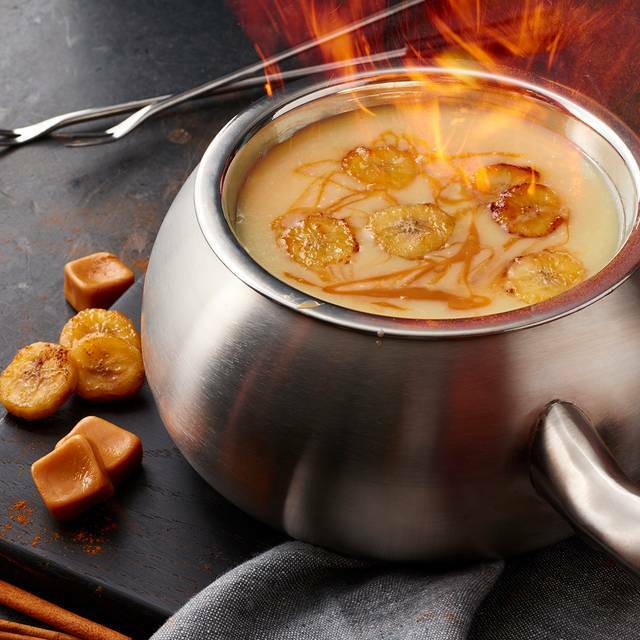 If you want to sample it just go for the dessert fondue or the cheese fondue. If you go for the full experience it's about $50 per person without cocktails. The whole experience was worth it. The food, server, and ambiance is top notch. Would recommend to anyone and everyone can’t wait to go back. We were on a vacation and wanted to try. For someone who likes cooked food ignore the 1 minute recommendation and keep it in longer. Service, food quality, and cleanliness was good.